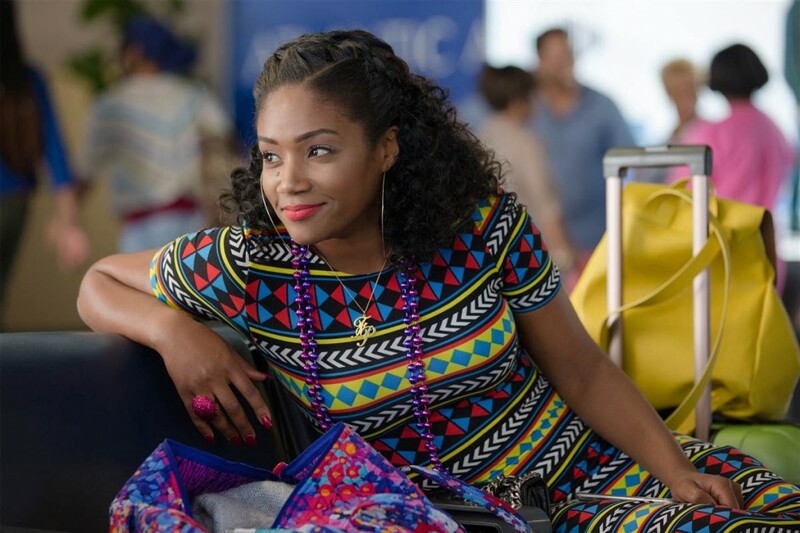 Tiffany Haddish stars as boisterous but warm-hearted Dina in “Girls Trip.” Photo courtesy of NBC. Comedian and actress Tiffany Haddish is on top of the world. She is the breakout star in the comedy hit “Girls Trip,” which follows the antics of a group of long-time friends who travel to New Orleans for the Essence music festival. And she will star in a one-woman comedy show on Showtime on August 18. But life has not always been so sweet for Haddish, 37, who grew up in Los Angeles. Her mother suffered a brain injury in a car accident, forcing a 9-year-old Haddish to care for her mother and four younger siblings. Later her mother developed a mental illness and Haddish and her siblings were placed in foster care. Haddish had difficulty fitting in at her new middle school and acted out. A social worker who noticed she was the class clown gave her two options — attend a Laugh Factory Comedy Camp or go into psychiatric therapy. Haddish chose the first option and soon found out that comedy and acting was where she fit in. In camp she worked with comedians Richard Pryor, Dane Cook, and Charles Fleischer. Love Tiffany Haddish!! Want to see her live. She’s amazing! Social Workers are changing lives all over the world! I encourage all Social Workers to continue the legacy of helping people reach their full potential. Proud to be a Social Worker . She made thé movie Girl Trip. Social Workers are changing the lives of so many people and the best is yet to come! I wish nothing but the best for Tiffany!! She is so talented and amazing. Hope this is just the beginning of a great career!!! Tiffany Haddish I am so happy for you. I love to see people succeed! I am interested in finding my purpose as a Social Worker, I have a passion to help young people but they are so angry and uncaring. How do we help them?